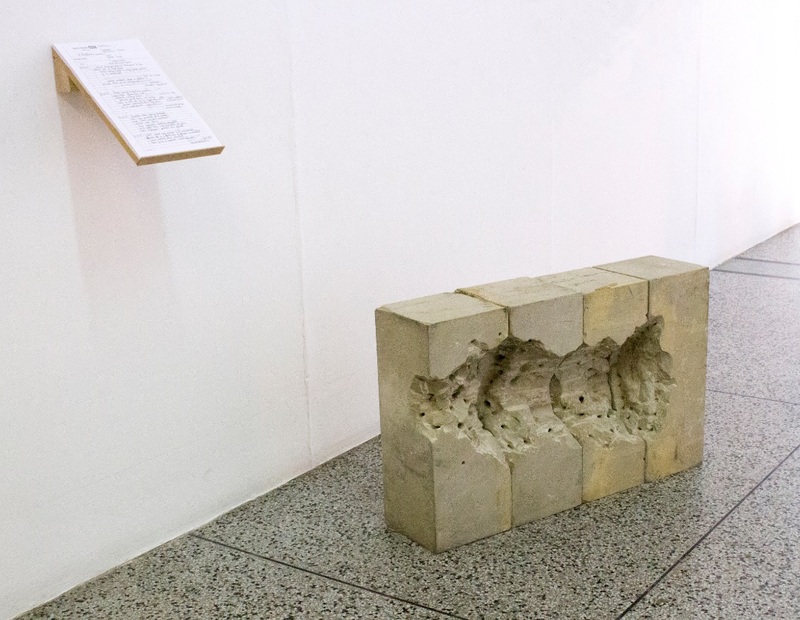 Inês M. Ferreira is one of our talented final year MFA Fine Art students who will be exhibiting her work at the MFA Fine Art Summer Show this year. We spoke to Inês about what sort of work she will be exhibiting at the Summer Show, the way her practice has transformed over the course of the MFA and what she has enjoyed most about studying at Wimbledon. My practice is based around the idea of the earth as a sentient being. There are lots of things that are contentious within the climate change movement to do with environmental stability that I tend to focus on. Even though my work is quite closely related to politics, I look at the origins of the problems like colonialism, post-colonialism, mineral extraction, oil, energy and all of those political environmental factors. I use a variety of mediums in my practice to demonstrate this. I was studying the MA Visual Arts: Book Arts course at Camberwell College of Arts and then I transferred here to the MFA, so I did my first year of the MA at Camberwell and my second year here. I was an illustrator and the Book Arts course allowed me to take that step into the Fine Art world. It was an in-between step that was really helpful. At Camberwell, I was making lots of books, naturally, but I was quite sculptural in the way that I was making them. Now that I’ve come here I’ve fully embraced sculpture and digital work also. Sometimes the video and the sculpture will work together but they are mostly independent of each other. But for the Summer Show, I will be showing video and sculpture together. How do you think your practice has changed and developed over the course of your MA studies? Postgraduate study has a process of transformation and my work transformed so much that I had to move here. I was very focused on form so that’s why I was making books, but then I realised my true passion was actually the content and knowledge seeking so I had to make a change. Part of my practice is the idea of traditional ecological knowledge, in which I look at how indigenous cultures preserve their own local ecologies and then I try and translocate that in a way that we in Western society can understand. What have you enjoyed most about studying at Wimbledon? I love the studio culture. Coming in at 8:30 in the morning with the sun shining through the window, eating my breakfast, getting settled in for the day, going to the workshops. I love the routine of going from the studio to the workshops over and over again. It makes you feel like an artist! The last couple of terms I’ve spent a lot of time in the foundry, and also the metal workshop, because I was doing my stone carvings right outside. I also did a little bit of wood work but it was more supportive elements and not part of the core of my practice. I had never done stone carving before but I had done wood carving, so I was very familiar with a chisel and malice and the endurance and labour of it. Transferring those skills onto stone was not so difficult for me. Casting in the foundry I had never done before and I have to thank Drew the technician for getting me into it! What have you found most challenging about the MFA? Sometimes the emotional rollercoaster can be challenging. I haven’t found the course hard, but if I had to choose the most difficult part it would be the critiques. As an artist, I aim to always be happy with what I create, but sometimes you get feedback and afterwards you feel less happy with what you’ve made. That can be quite emotionally draining. That being said, criticism is really good for development and I do appreciate it. Intellectually it doesn’t bother me at all, but emotionally it can be tiring. What made you decide to study the MFA Fine Art at Wimbledon? I wanted to have bit more of a studio culture in my place of study. Because the Book Arts course was all based around paper, you couldn’t really be messy or dirty in your studio space and I wanted to get dirty! Mostly I wanted to make sculptures because my practice had just expanded out of the book form. It will be a video and sculpture installation. The focus is on mineral extraction and how we should be recycling metal and not extracting minerals from the earth. It will be quite lyrical in a way, but with some ultra-corporate subversion included. Anything else coming up you’d like us to know about? We are putting together an exhibition, some of us, as a cohort that will take place the week after the Summer Show called ‘Signal to Noise’ curated by Charley Peters and that’s in Hackney Wick. I am also waiting to hear back about some residencies that I have been shortlisted for so I am waiting to hear back about those. Fingers crossed! You can find out more about Inês and her work by visiting her website and following her on Instagram. You can also see some of Inês’ video works on her YouTube channel.